Crystal Meth is a highly addictive drug, described as a ‘mix of laundry detergent and lighter fluid’, that can be made in any kitchen, with ingredients from the corner store. These include: Ephedrine or pseudo-ephedrine (found in cold medicine), and other chemicals including acetone, drain cleaner, lithium, iodine, paint thinner, kerosene, red phosphorous (found in safety matches) and muriatic acid (hydrochloric acid). Contrary to the impression the general public is getting in the media, Crystal Meth is not a new drug – it was widely used in the ‘60’s and ‘70’s, disappeared somewhat in the ‘80’s and has resurfaced in recent years. Meth is being produced in small labs in homes, garages, even vehicles, which makes it very cheap to produce and to purchase. A $5.00 “point” can create a very strong and long-lasting high, sometimes up to 24 hours. The drug’s affordability and ability to increase energy and alertness make it attractive to youth; its ability to mask cold temperature and hunger makes it very attractive to people in the street. The drug appears to be currently sweeping through communities. Although there is rising usage in large urban centres, Meth is wreaking especial human havoc in rural communities. On January 6, 2006 Headlines Theatre attended a meeting to which we had been invited on the Skwah Reserve (near Chilliwack) organized by Marion Robinson of the Fraser Basin Council with Skwah First Nation Band Councilor Lester Mussell and other community leaders of the Sto:Lo Nation, including Elder, Elizabeth Rose Charlie. In the meeting Crystal Meth was described as “the new plague”. The drug situation, it was said, on and off Reserve, is brutal. There is a measurable demographic of grandparents raising toddlers - the young parents, strung out on Meth, are absent; a whole generation is being lost in a slow genocide/suicide. There is a great deal of pain, people said, and many things are not being talked about. At the same time, they explained, community presentations from various authorities are telling them what they already know. Something else is needed. That ‘something else’, it was suggested, could respond to the focus on Crystal Meth, but also understand that the Meth issue is the current manifestation of a larger issue of drug addiction in our society. We have heard recently from numerous drug and alcohol counselors that the current public discussion about Meth is very similar to the discussion of 8 – 10 years ago about heroin. While the Meth issue is of immediate urgency, true prevention comes from an investigation of the human factors that lead people into addictive relationships with drugs, and confronting how we deal with addiction at a grassroots, human level. A story was told in the Skwah meeting about the issue of battering and sexual assault – of a time when communities across the province found it extremely difficult to discuss those issues. Then, it was said, something happened in 1992 that was a pivot point – something that Elders in many First Nations communities still talk about as having brought the issues into the open: the BC Tour of Headlines’ Out of the Silence, originally co-produced with the Urban Representative Body of Aboriginal Nations and toured in co-operation with the BC Association of Indian Friendship Centres. Out of the Silence was interactive, Forum Theatre. It opened up the potential for many communities, Native and non-Native, to deal with the issues of family violence at a community, grassroots level. A request was put forward in the Skwah meeting for Headlines to try to do the same with the issue of addiction. Since that meeting we have spoken with community leaders on the addiction issue in Vancouver and in other parts of BC. Response for a project like this has been enthusiastically positive. A project such as the one we are proposing functions from a philosophical understanding that knows that a living community has both the ability and the responsibility to deal with issues in the community. While the theatre expertise may be coming from outside the community, the knowledge that the theatre process unlocks resides in the community itself. Forum Theatre is an opportunity for creative, community-based dialogue. The theatre is created and performed by community members who are living the issues under investigation. Over the course of a six day THEATRE FOR LIVING workshop, participants engage in very specific games and exercises that help them investigate issues at a deep level. Then, they create plays. Each play is performed once, all the way through, so the audience can see the situation and the problems presented. The story builds to a crisis and stops there, offering no solutions. Each play is then run again, with audience members able to "freeze" the action at any point where they see a character engaged in a struggle. An audience member yells "stop! ", comes into the playing area, replaces the character s/he sees struggling with the problem, and tries out his/her idea. We call this an ‘intervention’. The process is fun, profound, entertaining and full of surprises and learning. "Thank you for a thought provoking, engaging performance. Practicing Democracy is theatre one does not walk away from but propels one to think about what I can do to help make our community inclusive and friendly." Because the actual content of a project like this must come from the workshop participants who are living the issues, it is impossible to be absolutely specific about what exactly will be addressed in the play, but we can be certain that the story will somehow deal with the complexity of human relationships that lead to addiction. As has been requested by many of the community members with whom we have consulted, addiction will be approached as a health issue – not a justice issue. We at Headlines know from years of experience that the project can and will function as a true voice of people who have themselves struggled with the issues. Because the play creators carry this expertise the play will certainly help communities seeking grassroots solutions. The workshop participants and cast will need to be people who are not currently Meth (or other drug) users. We will have to draw from a community of people who have been addicted but are no longer in the throes of addiction. Being in the play is not a healing opportunity – it is employment in a project the purpose of which is to create an artistic focal point for community discussion and transformation. The cast and workshop participants will be a mix of recovered addicts and people who have struggled with the addictions of family members and friends. Having a living knowledge of the issue will be one of the essential criteria for participation. Although Meth will be the focus of the workshop investigation and the resulting play, the interactive Forum Theatre events will have the effect of creating grassroots dialogue about the larger issues of addiction. Although performances will be booked in partnership with many First Nations communities, it is important that this touring production feature a Native and non-Native cast. Our discussions with various people involved in the issue, both Native and non-Native, and also many of the statements made at the January 25, 2006 Vancouver Crystal Meth Consultation sponsored by the BC Ministry of Public Safety and Solicitor General, indicate that dealing with the Meth issue is impossible for any community if they attempt solutions in isolation. Addiction in general and Meth addiction in particular is a cross-cultural and inter-generational issue. It also seems to us at Headlines that the project presents an opportunity for communities throughout the cultural spectrum in Vancouver and across BC to come together, sometimes across cultural divides, and to work together on a shared problem. Headlines has been very successful for many years at drawing out a broadly diverse audience. The audience’s engagement in the Forum Theatre process will build cross-cultural understanding and also help investigate solutions to the issues that are relevant to all audience members, in the communities in which they reside. We are in early stages of developing the networks that will support the Meth project. Headlines’ community-based working methods dictate to us that strong and broad-based community support and engagement is what helps create the success of our projects. In 2005 Here and Now our production on gang violence, was a broad-based collaboration. The outreach network included over 70 organizations and individuals, as detailed in Dafne Blanco’s and Manjot Bains’ Outreach Reports. This does not include the over 30 people who were directly employed by the project, the majority of them being community members. Our 2003 production, Practicing Democracy generated about the same level of organizational involvement. 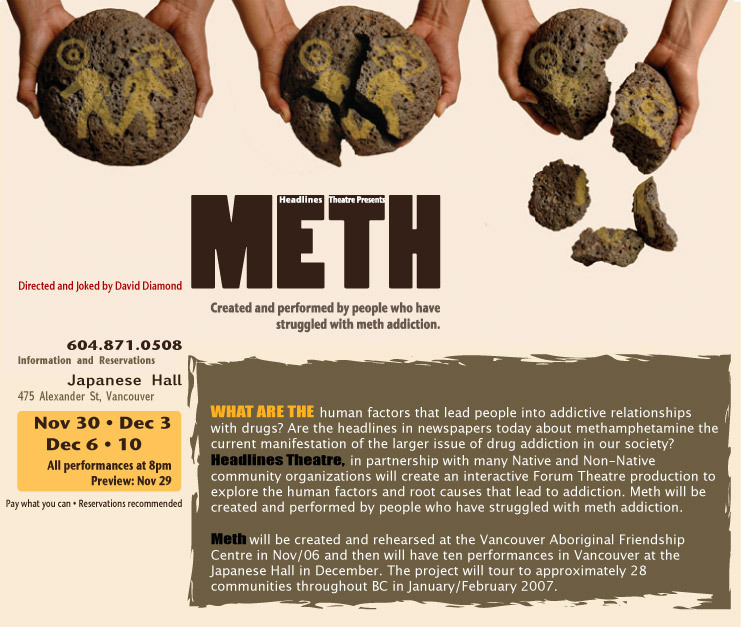 Because of the way in which Headlines works in community, the Meth project will stimulate at least the same level of community involvement, likely more because unlike the previous projects, Meth will tour throughout BC. This project will not deal simply with the symptoms of Meth addiction. Criminalizing addiction may be a partial “safe streets” solution at the back end, but it does not prevent addiction; addiction is not, at its core, a Justice issue. It is a Health issue. The Meth project will be powerful in community because it will have the ability to dig down underneath the symptoms and get to the root causes. It will investigate family and relationships and the tiny moments in our lives that lead us to addictive behaviour. Because it is theatre it does this at a symbolic, metaphoric level – the level at which humans articulate thought and feeling, which lead to action. In this way, the theatre project will support, but not duplicate, services that are offered throughout the Lower Mainland and across BC. “The Here and Now project holds a great deal of value within our local community and within our larger global community. Many of us can sit back and judge what needs to be done but by performing the actions - you become involved in not only critical evaluation but the common sense factor. I think this project was highly effective and positive on multiple levels. Does it have a concrete result? Headlines has a long and strong history of developing process-oriented theatre with communities. Projects are the catalyst for transformational dialogue. In 2002 we had the opportunity, through our production on school violence, Don’t Say a Word, to have a quantitative survey done by Dr. Shelley Hymel. The survey found measurable, positive result in the school regarding changes in attitude towards school violence and bullying. We have known this was true for years through anecdotal evidence, but it is great to have the hard, statistical data. What happened in the school also happens in the larger community. This was the case, we are certain, with Here and Now concerning issues of getting drawn into gangs and ways to consider exiting once one has entered the life. It will also be the case with the Meth Project. Excerpted from the quantitative report: "Impact of Headlines Theatre's Anti-Bullying Forum on Secondary Schools" April 4, 2003, by Shelley Hymel, Ph.D., UBC Faculty of Education. In October 2006, working at the Vancouver Aboriginal Friendship Centre, we will gather a group of up to twenty participants together who are living these and other connected issues identified by the community. Prior to the start of the research workshop, we will interview all the participants and from those interviews, decide on a cast. The workshop itself should not be an audition. It is important that each person coming into the process knows what their involvement and time commitment will be. All twenty participants will be paid to participate in a week long THEATRE FOR LIVING research workshop, out of which will come the core material for the Forum Theatre play. Using theatre games and exercises we will explore how the issues affect the lives of the participants. We will, at that point, be seeking to understand the struggles in which they are engaged regarding addiction. It is these points of tension that will form the subject matter of the play. The play will tell a story in which characters are struggling with the complex issues of Meth addiction. The Forum events will ask the audience to engage in concrete solution investigation. We will perform in Vancouver at the Japanese Hall for two weeks in November, 2006, and then tour into between 20 – 25 communities across BC in January/February, 2007. Community organizations involved in the issues under discussion will work with Headlines' Staff to promote the theatre events in their community spaces. This will mean touring with a portable stage, lights, sound equipment, etc. Headlines has a lot of experience doing this kind of touring. It is too soon to publish a real Meth tour itinerary, although we are already getting expressions of interest for performances. These are marked with an *. This tour will book easily, if we can pull the finances together. What follows is based on the 1992 Out of the Silence tour. *1 • Don’t Say a Word was honoured in 2003 with the Red Cross “Power of Humanity” Award. *2 • Practicing Democracy was honoured at the 2003 Jessie Richardson Awards with Jessies for “Outstanding Production” and “Significant Artistic Achievement”. As was the case with Out of the Silence, the Meth project will initiate collaborations among teams of counselors and support workers everywhere it performs. We will have a full-time addictions counselor attached to the project – in rehearsals and at all performances, including on tour. Part of the tour booking process will be to co-ordinate with addictions counselors in each community. Upon arrival in the community, while the technical crew is setting up the stage and lights, our addictions counselor will meet with the team of counselors from the community, to prepare them for the Forum Theatre event. The teams, having been at the event, will be available inside their communities for the requests for their services which will inevitably occur. We had reports of literally hundreds of people, including very visible leaders in communities across the Province, entering healing programs, counseling and detox as a direct result of the Out of the Silence tour in 1992. Admission for the Vancouver performances will be by donation. It is essential that people living in poverty are able to access the production. On tour, Community Sponsors will provide a $1,500 guarantee for each performance in their community. It will be up to the Community Sponsor to decide whether they charge an admission price, or make the tickets by donation or free. It is for this reason, making certain that the project is affordable for lower income people, that we are undertaking fundraising so much of the budget. We are currently in very preliminary conversations with SHAW Community TV. They are interested in partnering with us once again on an interactive tele/web cast. We do these tele/web casts, on average, once a year. This will broaden the reach of the performances greatly. It will also generate a non-commercial DVD that can be used by communities after the live project has ended. People around the world watched the live tele/web cast of Here and Now. We know that people tuned in from: across the Lower Mainland and BC, Canada and the US, from Australia, Japan, the Philippines, Korea, Austria, Belgium, Holland, the UK, Spain, Italy, India and Turkey. If an individual doesn’t express herself, she gets sick. In the exact same way, if a community loses the ability to express itself, it gets sick. The violence and various forms of addiction all around us are a sign of dysfunction at a deep level in all of our communities. The use of primal language (in this case the theatre) to tell collective stories (in this case about the community’s struggle with Meth addiction) and then the resulting community dialogue through Forum Theatre cannot help but be very healthy for the living community. The public aspect of these performances will bring various communities who share similar issues together and encourage them to problem solve collectively. In the process, they will recognize their differences and their similarities. They will engage in real dialogue, which breeds understanding. This level of the project is anti-racism work in a very subtle but effective way.